Amazing product for afro hair. Highly recommended! Does what you would expect from pomade. 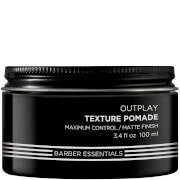 Has a lot of shine, medium hold as it says, and it allows you to do a slick back easily. Smells a bit chemically to me though. My hair is very bland as it is a dark brown almost black with no natural shine. I came across the AC Pomade and tried it out. While it does have medium hold i was very satisfied to see that my hair didn't look greasy or oily. It definitely had a natural looking shine. I usually pair this product with the American Crew Forming Cream as that product seems to have better hold, I use the Pomade to finish off my hair style and it is by far my favorite hair product. this is a fairly good product overall. Nice design and have an easy smell. The wax does not stick alot in your hand after use. The advocate part is the elegant design of the product. This is strongly recommend for any type of hair which needs to be shiny and in shape.